How much does it cost to travel to Tel Aviv? How much money will you need in Tel Aviv? ₪417 ($116) is the average daily price for traveling in Tel Aviv. The average price of food for one day is ₪83 ($23). The average price of a hotel for a couple is ₪516 ($143). Additional pricing is in the table below. These average travel prices have been collected from other travelers to help you plan your own travel budget. How much money do I need for Tel Aviv? Tel Aviv is the second largest city in Israel and is situated on the Mediterranean coast 60 kilometers north of Jerusalem. It's a rapidly growing city and is one of the most modern and cosmopolitan cities in Israel. The official name is Tel Aviv-Yafo because the city has grown to include the ancient port city of Yafo. If you're looking for an embassy, you are likely to find it in Tel Aviv, despite Jerusalem being the official capital of Israel. Tel Aviv has a Mediterranean climate and the summers are hot while the winters are mild and wet. January is usually the coldest month with an average high of about 64 degrees Fahrenheit and an average low of 48 degrees Fahrenheit. August is the hottest month with average highs in the high 80s Fahrenheit and lows in the low 70s Fahrenheit. 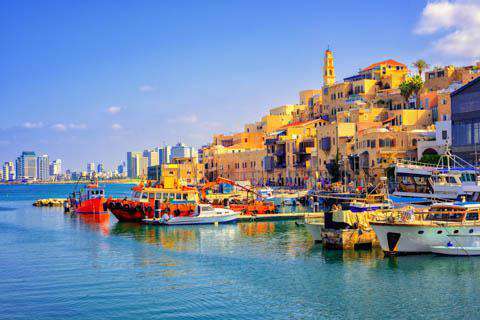 Areas throughout Tel Aviv that are worth checking out include Old Jaffa, which is one of the oldest ports in the world. You'll also find a popular flea market nearby. Rabin Square is the largest public square in Israel and Dizengoff Centre is the most famous shopping area in Tel Aviv. Also be sure and take a stroll down the shore promenade where you can people watch and enjoy the warm Mediterranean coastline. Joshua Gardens is Tel Aviv's main central park and is also worth a visit. There are also a handful of museums in Tel Aviv that are worth a visit. These include Tel Aviv Museum of Art and the Museum of the Jewish Diaspora. Tel Aviv is a city of neighborhoods, and you could easily pass several days exploring some of the more interesting neighborhoods. There are more than 50 neighborhoods in total with some of the more interesting ones being Neve Tzedek, Florentin, and Ramat-Ha'Chayal. The city center is at the heart of the city. This is where most of the tourist attractions are. This area is defined by Allenby Street to the south and Yarkon River to the north. The northern part of the city is the wealthiest area. There are many parks, Tel Aviv University, and Eretz Israel Museum in this area. The southern areas are younger and home to many foreign workers and illegal immigrants. Some of the neighborhoods have become quite trendy. Jaffa (Yafo) is one of the world's oldest ports and has a lot of religious and historical significance. There is no shortage of activities that you can enjoy while you're in Tel Aviv. Many people visit the beach, which is best enjoyed during the summer months. It's a festive atmosphere, particularly on Friday afternoons when music, barbecues, and party crowds are easy to find. If you're interested in enjoying performing arts, then your options include Israel's Philharmonic Orchestra, the New Israel Opera, Tmuna Theater, Suzanna Dellal Center, Habima National Theater, and Hacameri Municipal Theater. Football (soccer) is the most popular sport in Israel and there are three major football clubs in Tel Aviv. These are Maccabi Tel Aviv, Hapoel Tel Aviv, and Bnei Yuhuda. Popular festivals in the city include the White Night Festival, Tel Aviv Fashion Market, Night Flea, Docaviv, The Tel Aviv International LGBT Film Festival, the Tel Aviv International student Film Festival, and Ta'am Ha'ir. The restaurant scene is Tel Aviv is excellent. You can really find any food option you might desire. There are many international options throughout the city including Chinese, sushi, French, or Italian. Food can be quite expensive, and if you're on a budget you'll find falafel or hummus options at many of the street stands around town. The best way to travel between neighborhoods in Tel Aviv is by bus. The bus system, like elsewhere in Israel, is quite efficient and easy to understand. Another option is by taxi. Taxis are readily available almost anywhere. You can expect to pay anywhere from 20 to 30 NIS for a local ride in Tel Aviv, and do confirm that your driver is using their meter. Bicycling is also gaining popularity in the city. The flat terrain and comfortable weather make it a good place to explore by bike. There are an increasing number of bike paths around as well. You can rent bikes at several of the bike shops around town. Tel Aviv is a modern city, with an excellent party vibe and beautiful beaches. It has a completely different feel than it's nearby neighbor, Jerusalem. There are many international restaurants to choose from and tons of clubs to visit. One of the most interesting parts of Tel Aviv is the markets though. You can find fresh Mediterranean produce, homemade arts and crafts, among other things around these great street stalls. You can pass several hours checking out what people are selling. Some of the more interesting booths have photography from around Israel. The photography has managed to capture scenes at the Western Wall and various events than an outsider would never be able to capture.